This might be pilot error, might be bug report, or I believe most probably a feature request. second level: Folders by artists. So the "rock" folder could contain the Eagles, The Beach Boys, etc. The Classical Folder splits them by composer--which again has to be done manually as these days, the albums tend to be titled/authored by orchestras and other choices, not "Beethoven" or "Brahms". third level: The album folders themselves. So, for each folder on the second level, there may be a dozen sub-folders, each with one album in it. OK? Simple, logical folder organization? But Poweramp does not think so. If I ask Poweramp to shoe me my library by "Folder", it only shows me EVERY THIRD LEVEL FOLDER, all commingled. I can't say "Show me all the rock folders" or show me all the Polka folders. (Just kidding, no polka music here.) The only way that I can tell Poweramp "Show me all the Jazz folders and random play from that list" is if I either go into the setup and select ONLY that top-level Jazz folder as a music source, or if I go into the playlists after doing that, and compile a new playlist--which has to be done again every time I add a new album folder. Shouldn't there be a way to bring up the library, select FOLDERS, and have Poweramp recognize that their are tiers to the folders? Select from top-tier folders the first time, DRILL DOWN to select from second tier folders under one or more of those, and DRILL DOWN again if I want to get to the artist level folders? This is almost as frustrating as my car music player, which only knows how to do random tracks from "ENTIRE MEDIA?" rather than from a subfolder on that. And I'd be delighted to find out if this is just pilot error, and the latest v.3 Poweramp really does have some unintuitive way to accomplish this. REALLY delighted! Still my top choice in music players. If﻿﻿ I ask Poweramp to shoe me my librar﻿y by "Folder", it only sh﻿ows me EVE﻿RY THIRD LEVEL FOLD﻿ER, all com﻿mingled﻿. Did you try "Folders Hierarchy" ? blaubar, that would be perfect but the "Folders Heirarchy" choice does not appear on any of my devices, all of which claim to be fully updated. All Android devices, if that matters. Are you looking at a beta? Or are evil daemons hiding updates from me? Ah thank you. I was just poking around and saw that the SETTINGS menu will take me to the options where FOLDER HIERARCHY was hiding, unchecked..
And it seems that a rescan may have been necessary to get that fully recognized...I may be a little confused (caffeine shortage) but it looks like FOLDERS will show "All" of them, including all subfolders, and that in order to just drill down one setup, I have to go through the FOLDERS HEIRARCHY then. PILOT ERROR! Thank you, guys, for straightening me out on that. This will, once again, put PA way ahead of the competition and give me one more good answer when my friends ask "But why would you pay for a music player when your --- comes with one?" And give me a MUCH better way to change genres, and follow a couple of audiobooks, without having to swap media around. "Newbie" to the forums, but old timer to the app. "Folders Hierarchy" is like navigating in windows, when you drill down through multiple layers until you get to the level you want (and back up again afterwards). By the way, if you don't want to ever see the single top-level folder name within which everything else is stored in (e.g. just "Music") you can use Settings > Library > Lists > "Folders Hierarchy Immediate Root". 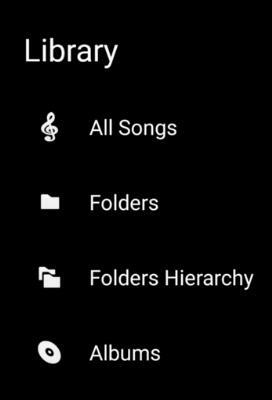 "Folders" shows a flat list of every folder with contents and you can scroll up and down to see every folder in your music collection. It's shown in the same actual order, but no need for drilling down.